A Facebook group of Chester County women named MomAdvice heard that Chick-Fil-A employee George Holston needed special diabetic shoes but could not afford them. With the original goal of raising $200, the group was on hand today to present Holston with the $1,800 collected in less than 5 days. DOWNINGTOWN – A community of Chester County moms who are a part of a Facebook page called MomAdvice, rallied around a beloved employee of Chick-Fil-A this morning. George Holston has been an employee of Chick-Fil-A for eight years. Always willing to lend a helping hand, offer refills or clear the tables, he has made a lasting impression on many. 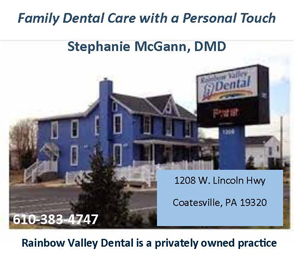 Last Friday afternoon, Jenn Fischer of Coatesville noticed Holston was wearing a worn-out medical boot on his foot and, out of concern, asked him about it. Holston explained that he has diabetes and needs special, custom-made shoes; insurance does not cover them and Holston could not afford the $200 cost. “When I saw George, a man that gives so much and is so genuine with his help, I was compelled to do whatever I could to help him.” Fisher said. The MomAdvice group currently has over 4,000 members and frequently reaches out to help others in need. There are several meal trains (a calendar of organized meals, designated to a person or family) set up for members who are sick or need extra support during difficult times. It is because of the support this group shows that Fischer decided to reach out and explain Holston’s situation. Hoping to collect just $200 for the shoes, the comments from members began rolling in and so did the donations. Fischer collected the funds through her Paypal account and regularly updated the page with the total. By 11 p.m. that same night, over $1,000 had already been collected. Jenn Fischer of Coatesville told Holston, “There is an overpowering amount of love for you,” as she presented him with the money collected by local moms through the Facebook group called MomAdvice. As of this morning, there was a bank check made out to Holston for $1,700 and over $100 in cash that Fisher collected in person. Also included were handmade cards from some children and another card with the name of each person who donated from the Facebook group. Previous arrangements were made with Chick-Fil-A so the MomAdvice group could present Holston with the donation and as a group of women from the MomAdvice page quietly gathered in the lobby to show their support for Holston, he was working nearby, having believed he was called in early, to assist with a special event. 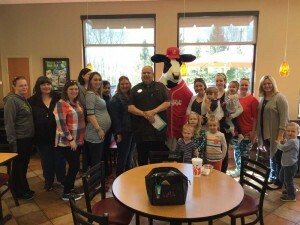 Shortly after 10 a.m., Holston escorted the Chick-Fil-A cow into the lobby, and was surprised when he was stopped by an entire group of women and children. “I don’t know what to say…thank you so much,” as he received the check and cards. Holston plans to buy a few pairs of the custom shoes with the money he was given – with the amount of hours he is on his feet each day, his shoes tend to wear out quickly. “It’s obvious by the outpouring of love from the group members that they all felt the same way and made this possible.” Fischer stated.